Photo by Royal-Athena Galleries From left: A 17-inch Attic black- figure lidded amphora, from the Leagros Group, circa 520–10; a 12-inch Roman marble head of Aphrodite, first century A.D., after a Greek original from the fourth century B.C., with traces of original pigment. The field of antiquities—the art of ancient Greece, Rome, Egypt and the Near East—has had some hard knocks lately. A spate of lawsuits and even a headline-grabbing criminal trial have focused the public eye on the pitfalls of the trade and on the international debate over whether or not it is ethical to collect ancient cultural objects. Yet demand and prices for antiquities remain strong. In part this trend is a testament to the fact that there’s no such thing as bad publicity—due to the news stories, more people than ever before are aware that antiquities exist, are beautiful and desirable and are for sale—but also, it reflects the fact that the antiquities trade has made important alterations in the way it functions. As a result, collecting antiquities remains a viable and vital pursuit, and is actually safer than ever before. Archaeologists have always been vocal in their opposition to the trade of antiquities, arguing that any market for such works encourages looting and the destruction of archaeological sites. But the real impetus behind the changes in the field comes from the efforts of so-called source countries such as Italy, Greece and Egypt to repatriate artworks from museums abroad on the grounds that they constitute a national cultural patrimony, and to accuse dealers of crimes or of complicity in crimes. Of all source countries, Italy has so far been the most successful in its efforts. To date, the J. Paul Getty Museum in Los Angeles has returned 40 antiquities to Italy. The Metropolitan Museum in New York has returned 21 pieces, the Cleveland Museum, 13 and the Museum of Fine Arts, Boston, 13. In 2006 the Met agreed to return a large bowl, or krater, made circa 515 B.C. and decorated with scenes from the Iliad, which represents the only surviving complete work of the great Greek painter Euphronios. One of the finest Greek vessels in existence, the Euphronios krater was looted from an Etruscan tomb and sold to the Met in 1972 by the American antiquities dealer Robert Hecht. Hecht, now 90, is on trial in a Roman courtroom, charged with trafficking in objects illegally excavated from Italian soil. In the same long-running preceding, Marion True, a former curator of antiquities at the Getty, is accused of knowingly purchasing illegally excavated pieces. The main way for dealers and buyers to protect themselves in this environment is to adhere to internationally agreed-upon guidelines. In 1970 UNESCO adopted the Convention on the Means of Prohibiting and Preventing the Illicit Import, Export and Transfer of Ownership of Cultural Property. Essentially, the convention declares the trade in archaeological objects illegal, although not retroactively—it applies only to objects excavated after it was ratified. Various countries have ratified it at different times—the United States in 1983 and Great Britain in 2003, for example—but the symbolic date remains 1970. Therefore, antiquities that can be proved to have been excavated before that date, by means of export papers or publications, may be legally traded. Museums and major auction houses now follow UNESCO guidelines, and will not acquire or sell anything after 1970. In the current climate provenance has become more important than ever before. “Provenance used to play second fiddle to quality and beauty,” says G. Max Bernheimer, head of the antiquities department at Christie’s New York, “but now it is king and reigns supreme. Even minor objects with good provenance sell very well.” That’s because well-documented objects are scarce. Torkom Demirjian, owner of Ariadne Galleries, which has branches in New York, Paris and Munich, says that 98 percent of the pieces he sees offered from old collections lack documentation. Jerome Eisenberg, owner of Royal-Athena Galleries in New York, tries to buy documented objects as much as possible, and yet, he says, of the 1,500 or so pieces he has in inventory, one-third have provenance. What about antiquities that have been out of their source countries since before 1970 but lack documentation, or for which documentation once existed but now has been lost or destroyed? They can be hard to sell now, especially to public institutions. “Museums and auction houses are scared by archeologist terrorists,” Demirjian says. Ede says, “We have gone too far the other way. Many objects are difficult to prove, even though our intuition, knowledge and experience tell us they are correct.” Dealers have adopted a caveat emptor approach, with full disclosure. “We research pieces as much as we can,” says Aboutaam, “and if we fail to find a provenance, we put everything on the table and let the buyer decide.” For those who are willing, undocumented objects constitute a distinct buying opportunity, and for private collectors, at least, there is very little risk that a modest piece will become a political football like the Euphronios krater. There is no question that in the early 1990s, when the amount of negative news about antiquities dealers rose sharply, customers were spooked and the market weakened. However, says Aboutaam, “it corrected itself with the knowledge of how to inquire about provenance, and now it is stronger than ever.” Examples can be seen at recent New York auctions. At Sotheby’s in December 2007, a tiny and exquisite Mesopotamian sculpture known as the Guennol Lioness sold for an astounding $57.1 million (est. $14–18 million) to an English dealer. The piece has an impeccable provenance and had been widely exhibited, in addition to having been on prominent view at the Brooklyn Museum for 60 years. The Martin family, who owned the lioness, had offered her privately for $14–16 million and are said to have had offers approaching that figure, but they shrewdly held out. More recently, on April 4, the sale by auctioneer Jack-Philippe Ruellan in Vannes, France, of the collection of Jacques Bellon saw prices that one dealer called “hysterical.” Eisenberg says, “I bid on 190 lots, and I managed to buy nine.” Many of the lots were preempted by the Louvre, including a Spartan cantharus (vase) that it bought for €110,000 (est. €20,000–30,000). In the sale of the Yves Saint Laurent collection at Christie’s Paris in February, a large Greek black-glazed hydra from the fourth century B.C., found in Italy, sold for €253,000 against a presale estimate of €15,000–20,000. A very old restoration can help rather than hurt a piece. A large vase that is coming on the market at Sotheby’s New York this month has both an impeccable provenance and an old restoration. A Neo-Attic marble volute krater from the late Hellenistic period, circa mid-first century A.D. (est. $250,000–350,000), it was restored in the 1630s by the Baroque sculptor Niccolò Menghini and was once owned by Cardinal Francesco Barberini. Every dealer hopes to attract new collectors, but some are making more of an effort than others. Charles Ede has a “New Collectors” section on its website, where objects priced under £1,000 ($1,400) can be acquired. “We started it a few months ago,” says Ede, “but I have been too busy to pay much attention to it.” Phoenix Ancient Art, on the other hand, which specializes in the very highest end of the antiquities market, is devoting much time and effort to a new website called e-Tiquities, launching this month. The site features objects available for purchase at prices ranging from $500 up, such as an Attic Greek terra-cotta lydion (vase) from 500 B.C. for $7,000. There will also be pieces that are auctioned directly from site, as with eBay. “We are using it for rare finds and trendy pieces,” says Alexander Gherardi, president of e-Tiquities. 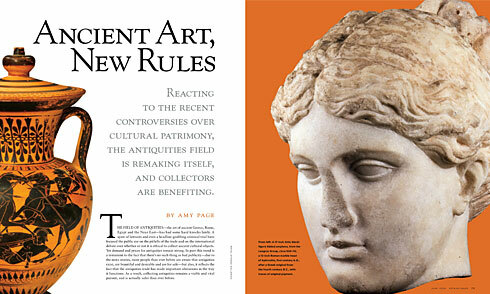 Like most of the art market the antiquities sector is somewhat bifurcated. According to Eisenberg, it is surprisingly strong for better pieces, but soft for smaller ones. Richard Keresey, head of antiquities at Sotheby’s, agrees, saying that the low end of the market—pieces under $7,000—is the weakest. According to Wace, pieces of artistic quality, rather than those of mainly historical or cultural interest, are most sought after. Eisenberg says that fine sculptures in marble and bronze are popular and that good Greek vases are always in demand.